Join us, and discover your own way of unfolding beyond the lunar cycle. 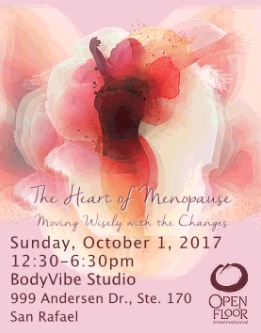 The Heart of Menopause is a safe, creative, powerful gathering of women in all stages of menopause. Too many of us undergo this unique, natural life transition alone. Come dance, meditate, explore and share. Learn about the processes occurring in your hormones, body and psyche. Learn to wisely navigate the transformational menopausal experience and deepen your connection to yourself.